The following sign made me smile when I noticed it outside one of our classrooms last week. No one can accuse us of living in an ivory tower. Does it get any more down-to-earth than asphalt maintenance? Here’s what I love about it. 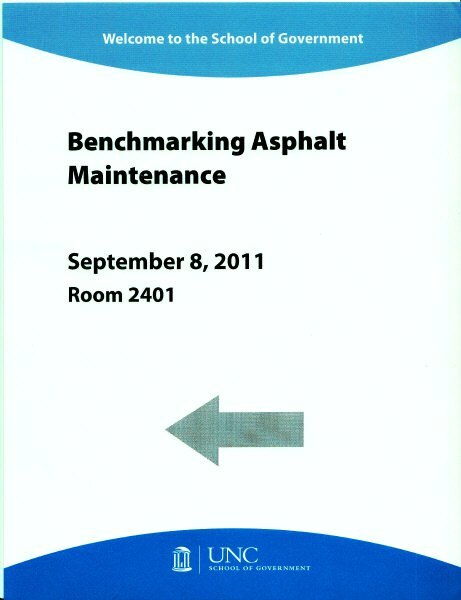 The sign was for a meeting related to our North Carolina Benchmarking Project, which is directed by Dale Roenigk. The project is a wonderful example of engaged research that has great practical application for cities. Since 1995 we have worked to help local governments compile service and cost information, calculate performance measures, and compare the results. Local governments have used the data to improve services and save money, and we have learned more about the necessary elements for successful benchmarking and performance measurement. The project also has generated a number of useful technical reports and other publications. Data collection is critically important to the project, of course, but these meetings are not as important as others that bring the participants together to discuss best practices. This is where the rubber really meets the road. Sorry. The best-practices meetings, according to Dale, are “where we focus on the comparative data we have been collecting for the story they tell and share ideas and experiences for how the cities might improve their services and explain what they are accomplishing to their managers, boards, and citizens.” Dale will lead separate meetings in October for people working on services related to fleet maintenance and building inspection. Dale has done a wonderful job leading the benchmarking project and has managed to maintain a core group of participants during tough budget times. The project is funded by fees from the participating units. Others who have been instrumental in the project’s success are David Ammons, Jack Vogt, and Bill Rivenbark (who directed it before Dale). Dale is involved in so many things at the School, like teaching in the MPA Program, organizing sessions about PowerPoint, and generally serving as our resident guru on organizing and manipulating data. It sometimes is easy to forget that the Benchmarking Project is his full-time job. Nice work, Dale.